Keeping your children safe on social networks like Facebook is a challenge, especially if you want them to have any semblance of privacy. But Check Point's new ZoneAlarm SocialGuard ($20, seven-day free trial) can help: It offers an easy way to guard against potential threats while still allowing your children the freedom to explore Facebook's offerings. 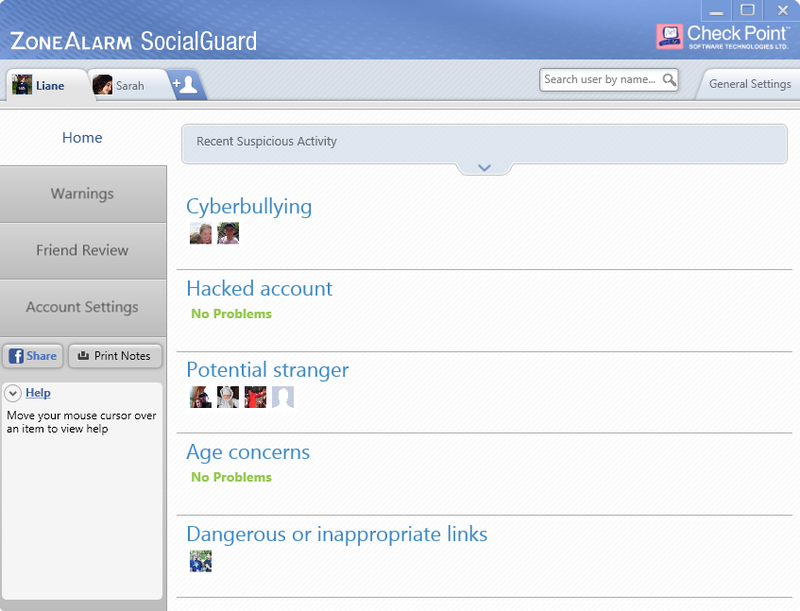 ZoneAlarm's SocialGuard makes it easy to identify which Facebook users may pose a threat to your child. SocialGuard can be used to monitor up to five Facebook accounts. You'll need the username and password for each account that you'd like to monitor, so it's not a covert spying tool. The Facebook users also receive a message that their account is being protected, but that message is only visible to them--their friends cannot see it. SocialGuard does not block or hide content on the user's page. Once installed, SocialGuard scans the linked Facebook accounts, looking for potential strangers, possible cyberbullying, malicious links, and hacked accounts. The neatly-organized interface makes potential threats easy to identify. Potential cyberbullies are identified based on the language they use when sending both public and private messages to your child. ZoneAlarm automatically flags some curse words--which is only a partial solution--but you can customize the list to your liking. You also can tell the app to ignore the first occurrence of a word, so that you're only alerted if it appears multiple times. SocialGuard also identifies potential strangers, using criteria such as a lack of any common friends, as well as Facebook users with questionable activities, such as adults who friend many children, or those who may be trying to pose as children but are, in fact, adults. In the case of my own Facebook friends, it correctly identified my friends without a stated age as adults. You can choose to have SocialGuard send alerts to you via e-mail, or you can monitor the account only by logging into the app itself. You also can determine which words you'd like SocialGuard to be on the lookout for. SocialGuard certainly isn't perfect. In my tests, it identified several actual friends as potential strangers simply because we didn't have any friends in common--a situation not unusual for an adult and a journalist, but potentially dangerous for a young child. It also flagged one harmless link as malicious, seemingly because the site it pointed to was still under construction. But when it comes to protecting your children online, it's better to err on the side of caution. And this easy-to-use app offers parents a great starting point for talking to their children about social network security.